Offers Welcome, owner is very keen to sell. Stunning Cortijo in San Martin del Tesorillo. Property near Sotogrande, Cádiz, Andalusia. 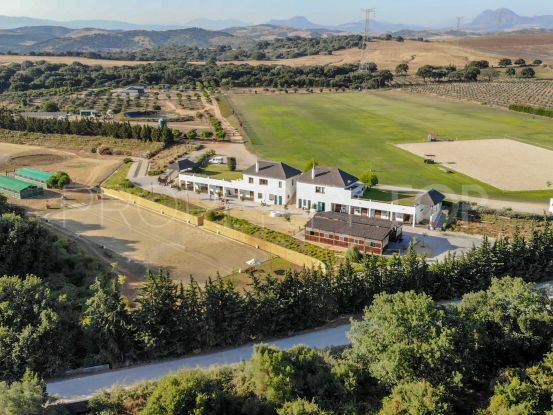 An outstanding equestrian finca set in a beautiful countryside with wonderful views. The main house is approached through an Andalucian style courtyard with fountain leading to the attractive entrance hall with cloakroom and a spectacular high ceilinged drawing room with open fireplace and direct access to the terrace and garden. The excellent large kitchen with Aga and Bosch appliances and breakfast area with access to the large terrace and open-air dining overlooking the pool and garden has on one wing double doors opening into the dining room with sliding doors to the library/sitting room with open fireplace. On the other wing, you find a huge living room with access to a beautiful patio. The master bedroom suite has a large dressing room with an excellent range of cupboards and en-suite bathroom with separate shower. There are two further bedrooms, one with en-suite bathroom with separate shower which is also accessed from the master bedroom suite and the other with en-suite shower room. Self-contained granny/guest suite accessed from the inner hall or the exterior, shower room, living room with open plan kitchen. Walk-in cold store, utility room and shower room. Courtyard with storage and the boiler room and entrance to the annexe with sauna, hammam, shower and cloakroom. A spiral staircase up takes you to a large bedroom with a roof terrace. Two staff or guest cottages, one with two bedrooms, bathroom, sitting room and kitchen and the other with one bedroom, bathroom and sitting room with open plan kitchen. Large salt water swimming pool with pagoda-style chill out area with built-in seating. Covered barbecue area/outdoor kitchen and a large terrace with country views. Stables with boxes for 12 horses with the possibility for additional stables, a paddock, a circular riding school and space enough for a polo field or a professional sand school or even a professional indoor riding school. Large tack room with shower room. Mains electricity and generator back-up. There is a well with exclusive water rights, so there’s an abundance of water supply, water deposit with water softener and an additional rainwater deposit. Security system with surveillance cameras. Gas central heating on radiators. In the main house only, there is air conditioning in the bedrooms and office and underfloor heating in the main bathrooms. Oil central heating in the two cottages. Superior quality house. Here you live in harmony surrounded by beautiful nature, only 20 minutes away from Sotogrande, 35 minutes from Gibraltar airport. Ideal for horse lovers who want to have the coast and its facilities at easy reach. Please, send me more information about ref 186-00278P in Sotogrande or similar properties. Need Advice buying this property for sale in Sotogrande? Disclaimer This is a property advertisement (REF 186-00278P) provided and maintained by Villas & Fincas, Carretera de Casares - Barriada Los Ponis, Nº8 B 29690 Casares Málaga, and does not constitute property particulars. Whilst we require advertisers to act with best practice and provide accurate information, we can only publish advertisements in good faith and have not verified any claims or statements or inspected any of the properties. PropertyTop.com does not own or control and is not responsible for the properties, website content, products or services provided or promoted by third parties and makes no warranties or representations as to the accuracy, completeness, legality, performance or suitability of any of the foregoing. We therefore accept no liability arising from any reliance made by any reader or person to whom this information is made available to.